Seon Yu’s revenge will start because justice for her deceased sister fails. I, even knowing how vile and cunning Tae Jeong really is, was shocked by just how prepared he was to face the Heos’ allegations against him. And while I do understand Dal Nyeo wanting a good life for her son… she shouldn’t be supporting his future at the sacrifice of Jin Yu and their baby. I do wonder if Ji Hui will be able to carry this baby successfully to term or not… Tae Jeong doesn’t deserve a child, especially if the baby is his stepping stone into the world of wealth and power. You know…if Ji Seok and Seon Yu aren’t together on the screen…I’m not as interested in what’s going on. I miss them being together as much as they were in the beginning. Fingers crossed that when this newly shortened drama’s revenge scheme kicks into full gear, they will be in on it together. Dal Nyeo makes a snap decision and shoves one of the watches back into the coat pocket before Pung Ho and Bong Hwang get the door open. Bong Hwang immediately begins searching Dal Nyeo after the woman reports there is nothing she can possibly steal. I can’t believe Bong Hwang totally missed Dal Nyeo desperately clutching onto her pocket to keep her from discovering the watch, but she did. Dal Nyeo’s theft of the baby’s clothing is discovered though and Dal Nyeo puts up a front about how she keeps thinking about Jin Yu and the baby and feeling guilty. Pung Ho tells her to take the clothes and Dal Nyeo makes good her escape. She is worried if she switched out the right watch or not, but decides not to care and not to tell her son about the hitch. She clutches Sarang’s little outfit and says he saved his grandmother. Bong Hwang then worries about the watch. Did Dal Nyeo somehow found out they had it and then come to steal it? Pung Ho tells her not to worry as he put it away in his pocket. Again, I ask myself, why do they have the watch back instead of the officer having it in his possession? Sure, the plot wouldn’t go forward with Tae Jeong getting in trouble now, but I’m supposed to believe a cop will hand back what could be evidence in an abduction/murder case? Right. Okay, enough digressing. Ji Seok does have a request of Seon Yu who is being sequestered before taking her vows—to be her normal, cheerful self when he sees her again. Yeah…so not going to happen until Seon Yu can get justice for Jin Yu and Sarang. He asks her to promise him this. Didn’t Mother Superior already scold her NOT to make promises she obviously can’t keep? I can’t foresee Seon Yu actually making that promise. Tae Jeong meets with mommy who confesses how nervous she was and I think she might confess about her own nightmares or guilty conscience over the whole matter. Tae Jeong says that he himself doesn’t sleep at night to avoid the nightmares. He’s only human and there is no way this incident hasn’t affected him, but he’s struggling to survive right now. Right. And that makes everything you’ve done magically okay Jacky Jerkface! He goes to work where the detective takes him in for questioning as a “witness” to the accident since he supposedly was with Jin Yu. Pung Ho and Bong Hwang go down to the station with the watch. When confronted with this, Tae Jeong shows his newly reacquired watch. This astounds Pung Ho and his wife. Tae Jeong tells the officer to call up the store and confirm the serial number. Lucky him, his mother did make a successful swap and his ends up being the real watch. The friend who was threatening him then comes in to stand as his alibi for that night and he even has doctored video footage as proof! This throws Pung Ho and Bong Hwang in a bad light, painting them as horrible people trying to set Tae Jeong up. Pung Ho throws a royal fit, but can’t do much in a police station, can he? Well, at least Tae Jeong didn’t ask his friend to murder the driver like I thought he would. Afterward, the friend chortles over the matter and the good job and thanks Tae Jeong for getting him the contract. Enter Ji Seok. 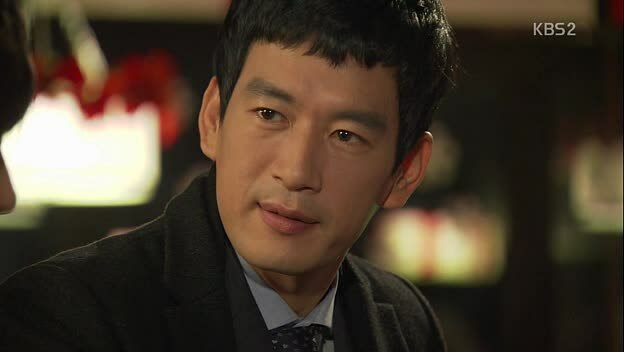 Tae Jeong says the other man is late and Ji Seok apologizes as an important matter came up. The two then go out to the bar and Ji Seok asks after the friend as he has seen Tae Jeong arguing with him before and mentioning a wife. Tae Jeong insists he got the contract for his friend out of pity only—not because of the threat of an old girlfriend. Ji Seok does say that while he isn’t close to Madame Wu…that doesn’t mean he isn’t close to Ji Hui as well. He doesn’t want anything bad for his sister, so you can understand his concern, right? Ji Seok, rather unconvincingly does say that he has not other recourse but to trust in Ji Hui’s decision. Right. Even if he wants to be supportive, and even though you know he doesn’t trust Tae Jeong at all, he shouldn’t say that he will accept Ji Hui’s choice and should do his best to kick Tae Jeong to the curb before he can do more damage. Ah, one other reason I watch this show—samchun! He’s so adorable. He greets Ji Hui with a cheerfully bright “hi baby!” to which she has to say she isn’t a child any more. Wu Hyeon says that he is greeting the baby in her tummy. Ji Hui says that this baby is like his grandbaby which makes him think his mom is Ji Seok’s grandmother… so he’ll be a halmeoni? No, he’s a man, so he’ll be a harabeoji. Wu Hyeon freaks out about this. he’s a grandfather now, too? Oh no! This can’t be as he isn’t even married yet! LOL. PRICELESS! He then runs away as Ji Hui goes to leave. But then she gets a little sick and has to rush to the bathroom. This is witnessed by Aran who brings her daughter tomato juice which was one of the only things she herself could tolerate when she was pregnant with Ji Hui. It’s amazing how much her daughter takes after her, isn’t it? Ji Hui is happy as her mother is forgiving her and becoming more accepting of the situation and the baby. Tae Jeong and Ji Hui are then called into Granny Gong’s office. What does halmeoni want? As much as she is not happy with the current situation, she is giving the kids her blessing to get married. This makes Ji Hui very happy and of course the social climbing scum Tae Jeong as well. Mrs. Gong does have some words of caution for her soon-to-be grandson-in-law. She doesn’t hate Tae Jeong and she, like Ji Seok, worries about trusting his words (about having a woman on the side, etc. 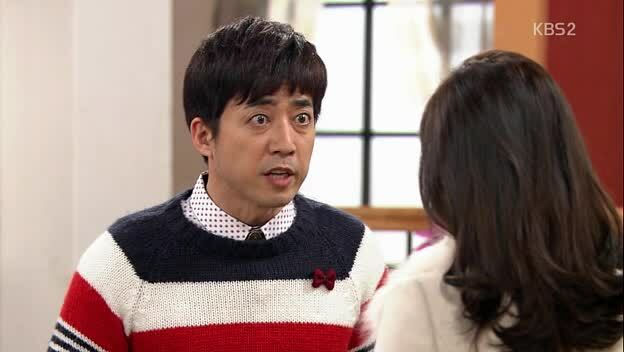 ), but her main reason for disapproving of Tae Jeong all of this time is due to the hunger in his eyes. I was against you in the beginning not because of your family. It was because of your ambition. Anyone can be greedy and people can make mistakes, but all things come with a price. If you’re too greedy, you lose much more than you gain. Amen, halmeoni! Tae Jeong may be gaining now, but he’ll find out (hopefully) in the end that he will have lost more than he bargained for. I sincerely hope mommy dearest turns her back on him for some reason. The two leave Mrs. Gong’s office and Ji Hui ecstatically hugs Tae Jeong. Now all they need is Aran’s approval. Mummy is with her assistant looking over Tae Jeong’s information. He got into the company on his own merits and quickly became the youngest section chief or something like that. Aran always knew he was capable, but it’s his background that is lacking. This won’t do. If Ji Hui marries him, Aran must know the truth. So Aran calls up Dal Nyeo and the two meet up. Aran asks her who “plucked the wildflower” (this really had to do with Dal Nyeo’s flattery on looks and wildflowers vs. hothouse flowers I guess). What is Tae Jeong’s parentage. Dal Nyeo immediately says that even if you threatened her with death, she is not allowed to say. Is this really just hype to improve her son’s value, or does he really come from a wealthy and powerful man? Hard to say. At the Heo household, Pung Ho is lying in bed miserable and Bong Hwang is wondering just what happened. Pung Ho then recalls Dal Nyeo’s visit earlier. It HAD to have been her. He rushes out followed by his wife and they catch the returning Dal Nyeo. Gone is the kind oppa and he know grabs her by her coat and starts shaking and asking her about Tae Jeong and Jin Yu and Dal Nyeo lets it slip before she’s even asked that she never switched the watches. Idiot. She does manage to slip his grasp and run away to her house where she tells her daughter to make sure to lock the door so Pung Ho and Bong Hwang can’t come and get her. At the convent, Seon Yu gets good news that the missionary group she applied to go overseas with is accepting her application. She will be able to leave not long after she takes her vows. This makes Seon Yu happy. She believes it is a gift from Jin Yu… and then she gets the call from her uncle about Tae Jeong escaping justice and she runs out of the convent. Mother Superior stops her and tells her she cannot leave before taking her vows. Seon Yu pleads that she must go as her sister died unjustly. If it means forsaking being a nun…will Seon Yu still leave? Yes, she must. End episode! Well…I think we all know that no matter how good Seon Yu is, she is not destined for sisterhood. (And that’s not my OTP bias speaking either, honestly.) I’m a week and a half behind, but I know that Seon Yu starts stalking Tae Jeong and Ji Hui later. I can’t wait until she drives Tae Jeong crazy. NeeNee, I’m not sure about you but I get this impression that even with Ji Hui’s pregnancy, Tae asshat Jeong still doesn’t want this baby. Is it because of what happened to him? Growing up fatherless? Anyway, I’m so afraid to know TaeJeong birth secret now. Who is his father? Do you think they’ll add his birth story since Ji Hui’s mom is sort of persistence with who the dad is? As much as I kinda love his bubbly yet dumb mom, she’s so ignorant and clumsy to the point I want to smack her head! She knew what’s wrong and right yet she went along with her son’s stupid scheme! Aish I’m ready for my punchbag with TaeJeong’s face on it! I don’t know. He really doesn’t seem too excited. The only thing that really made him smile happily was Mrs. Gong’s and Ji Seok’s “consent” to follow Ji Hui’s decision. He had said in the past that he wanted children so he could be the dad he never had…but somehow I don’t think those feelings remain intact anymore. As for the birth secret…it’s so hard to tell with his airhead mother. Is she just bluffing to up his value or is he really the son of someone important? I think they might just introduce this secret and then not delve into it, but who knows? As for Dal Nyeo, I know she feels badly about how she raised her son and how she used to complain that he kind of destroyed her life at one time…but that doesn’t mean she has to go along with his scheme that only hurts more people. She obviously knows better and knows its wrong and it does seem to irk her conscience…so TRY to stop Mr. Jerky Jerkface instead of letting him get you into more trouble. Got to hand it to Tae Jeong – he really knows how to get others to do his bidding. He was made for management. Yes, I got that impression too that he doesn’t want a baby even with her! Also, as a side note, was anyone baffled by when TJ pushed her down in a field of brown grass, her head happened to find the only rock in sight. And it just happened to be rather large too ?? ?